The procession has turned into an annual ritual: The Wildcats advance deep into the NCAA tournament, lose much of their team via early-entry draft declarations, and reload with a new crop of freshman talent to repeat the process the next season. In his six seasons as Kentucky coach, John Calipari has watched 25 of his players have their names called at the NBA draft. In that span, the program has produced three no. 1 overall picks: John Wall (2010), Anthony Davis (2012), and Karl-Anthony Towns (2015). “There’s a small percentage of guys that actually have the opportunity to go one-and-done, and Kentucky does that for guys,” said Jason Delaney, who coached 2015 lottery pick Trey Lyles at Indianapolis’s Arsenal Tech High School for much longer than Calipari had him at Kentucky. “If you go there and do what you’re supposed to do and play at your potential, then you’re going to have that opportunity.” In fact, the Louisville Courier-Journal recently projected that Calipari’s players (including those who played for him at Memphis) could soon surpass a combined billion dollars in active NBA contracts. The number currently stands at more than $750 million, bolstered by the $145 million extension Anthony Davis signed this summer with the New Orleans Pelicans. At the press conference, he asked those who had declared for the NBA draft to stand up. “Really?” he asked when no one rose. Then the players all stood in unison. Booker is a sharpshooter who has drawn favorable comparisons to Klay Thompson. Like the rest of his teammates, he had his choice of colleges. He likely could have taken every shot he wanted at Missouri, where his father, Melvin, had been a star. “You play in the NBA, that’s not how it’s going to be,” Booker said. “Very few people get that role to be that dominant ball stopper basically and just get a bucket. There’s not many of [them] in the NBA, so I feel like Kentucky was the best thing to prepare me for the next level.” Even Towns, who became the first overall pick, averaged only 21.1 minutes per game at Kentucky. These seven were college teammates on the cusp of perfection only five months ago. When the NBA season tips off this fall, they will begin their pro careers from different starting points — as the top pick, as lottery selections, as second-rounders, and as an undrafted free agent. Their paths, which had been linked during their quest to make college basketball history, must now diverge. 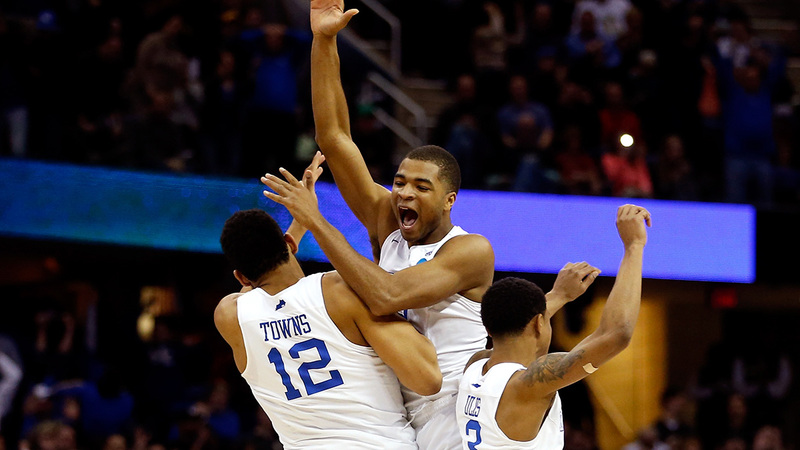 Gregory Shamus/Getty Images Aaron Harrison, Karl-Anthony Towns, and Tyler Ulis celebrate after defeating Notre Dame in the 2015 Elite Eight and extending Kentucky’s record to 38-0. It would be their last win of the season. The Harrison twins watched the draft from their home state of Texas. They had been top recruits out of high school, and NBA scouts loved their fearlessness on the court, but questions remained about their body language and outside shooting. Even so, Andrew Harrison went in the second round, with the 44th pick to the Phoenix Suns, who later traded his rights to the Memphis Grizzlies. Four picks later, the Oklahoma City Thunder selected Johnson. 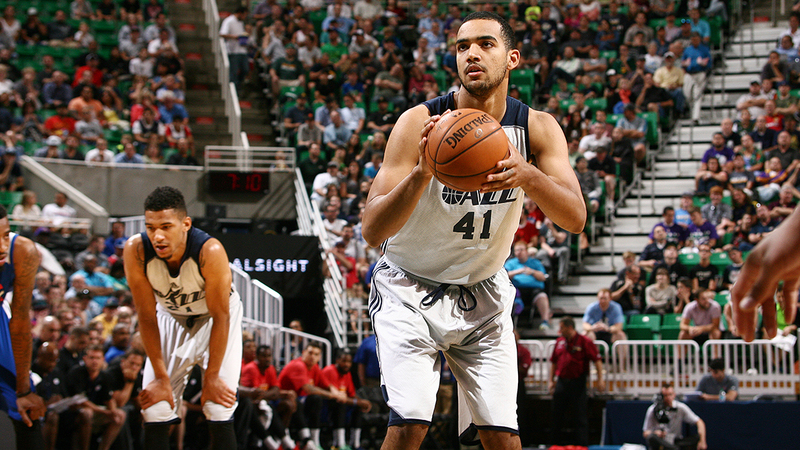 Melissa Majchrzak/NBAE/Getty Images Trey Lyles shoots a free throw at NBA summer league. Even for the best college basketball players, competing in the NBA is an adjustment. Everyone in the league is long, fast, and skilled. A player needs to read and react quicker to get his shots off on offense and to avoid getting beat on defense. There are off-court reminders of the transition, as well. For Aaron Harrison, it was a few weeks ago, “when I started paying for all my own shoes and stuff.” After Minnesota’s second summer league game, Towns sifted through trading cards provided by Panini before a media appearance. He and several of the other top draftees had signed deals with the company, and he examined every card like a kid who’d received a box for his birthday. “Just played him yesterday,” Towns said, holding a card of Lakers guard Jordan Clarkson. Aaron played well enough at summer league to earn a two-year deal from Charlotte. “He is a talented young player with a lot of potential and we look forward to seeing what he can do moving forward,” Hornets GM Rich Cho said in a statement. The scenario evolved how Calipari hoped it would once Harrison had been passed over on draft night. “It ended up playing right for him,” Calipari said. Expectations are higher for Towns, who will be tasked with helping turn around a Minnesota franchise that lost 66 games last season. The four losses the Timberwolves sustained in summer league surpassed the combined number Towns had suffered at Kentucky (one) and in his final high school season (two). Booker was also confident. “That’s a big statement saying that we [could] beat a lot of teams in the Eastern Conference,” he said. “I know we’d win some games, but I don’t know if we’d make the playoffs or anything like that.” Booker had started the summer struggling from long range. “[I’m] off to a slow start, but overall, the game’s just faster, more physical and I’m getting used to it.” After missing his first eight 3-pointers of summer league, Booker rallied to end 12-for-30 from beyond the arc. The Suns lost in the title game, and Booker finished as Phoenix’s third-leading scorer with averages of 15.3 points, 4.9 rebounds, and 1.7 assists. For the most part, all seven Kentucky players showed promise over the summer. Lyles ended summer league by nailing four of seven 3-pointers against the Lakers. “I’m not going to say it’s easy, but it hasn’t been that hard for me going from Kentucky and playing against NBA players every day in practice,” Lyles said. While Calipari looks forward to his players’ NBA success, he also has reinforcements on the way at Kentucky. The day before the draft, Jamal Murray, a highly touted Canadian guard, announced his commitment to the Wildcats. The incoming class also includes Skal Labissiere, ranked by many as the top overall recruit, and McDonald’s All American guard Isaiah Briscoe. Even though Kentucky doesn’t have the championship to repeat in 2015-16, the Wildcats can repeat their dominance in next year’s NBA draft. This number likely could have been higher had junior Alex Poythress not torn his ACL in December.